Home » Uncategorized » What Is Fractionated Coconut Oil & Is It Better Than Regular Coconut Oil? ​Coconut oil is a healthy fat that is rich in medium chain fatty acids. MCTs have many benefits to your mind and body including helping you lose weight and helping treat Alzheimer's. Fractionated coconut oil is extracted from pure coconut oil It consists mainly of 2 specific MCTs. Fractionated coconut oil should stay a liquid in cooler weather or if you store it in the fridge; rather than turning solid. It is a shelf-stable oil that has an indefinite shelf life. Below we take a more thorough look of fractionated coconut oil and its many benefits besides its ability to stay liquid when cold. Fractionated coconut oil is made from normal coconut oil. 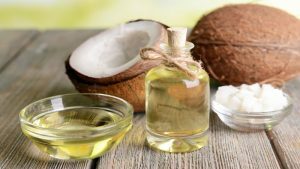 Both forms of coconut oil are great sources of medium chain triglycerides, however their composition and fatty acid profile are very different. The main fatty acid in coconut oil is lauric acid whereas most, if not all, of this is removed from fractionated coconut oil. The long chain fatty acids also are removed from fractionated coconut oil. The main MCTs in fractionated coconut oil are caprylic acid and capric acid. These 2 fatty acids are metabolized different to other fats. They get transported straight to the liver from the digestive tract, which gives you an instant energy source. Fractionated coconut oil is odorless and tasteless which is a benefit to many over normal coconut oil. Summary: ​Fractionated Oil is made from normal coconut oil and mainly consisted of caprylic acid and capric acid MCTS. Fractionated coconut oil is made through a process called fractionation, which comes to no surprise considering its name! Fractionation separates out different types of fats that are found naturally in some oils. This is possible due to the different melting points of different fats. Lauric acid has a higher melting point than caprylic acid and capric acid (all found in coconut oil). Therefore lauric acid will become solid sooner when cooled down. So to fractionate coconut oil it is heated above melting point. It is then left to cool and the solid fraction of oil is separated from the liquid part. This whole process can take several hours to complete. Generally it is often regarded better to avoid overly processed foods and supplements and stick to minimally processed products instead. In this case the processing may actually provide a better product. With many other types of oils, in order to break them down and separate out their components, solvents are often require and very high heats. These solvents are often petroleum based as well. This isn't hte case with fractionating coconut oil. Summary: ​A process called fractionation is used to produce fractionated coconut oil. This requires heating coconut oil to above melting point and letting it cool so that the fats separate out into solid and liquid forms. They are then separated. Fractionated coconut oil is always liquid at room temperature, while coconut oil is a white solid. Coconut oil is around 50% lauric acid where as fractionated oil tends to have lauric acid removed. Regular coconut oil has long chain triglycerides while fractionated has had them removed. Fractionated oil tends to be used for hair and skin care products, while coconut oil is used for cooking. Generally fractionated concout oil is similar if not the same as MCT oil. However always check labels as not all MCT oils are made equally. Some choose to add palm kernal oil into their products which isn't healthy. 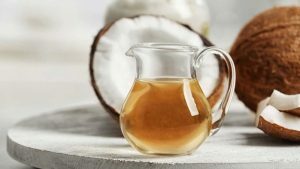 Summary: ​Fractionated coconut oil is ​always liquid at room temperative, has no or little lauric acid and has no LCTs - all properties of regular coconut oil. Fractionated coconut oil is marketed under a few different names and the name usually gives an indication of how it is used. They are generally all the same product though. Fractionated Coconut Oil - This is mainly used for personal care products like moisturizers, hair care and massage oil. MCT oil - This is used as a dietary supplement and people usually consume 1-2 tablespoons daily. Liquid Coconut Oil - This is marketed as an edible oil for cooking with. As explained, fractionated coconut oil generally doesn't contain any lauric acid - it is removed. It may have very small items left over but nothign compared to the amount if regular coconut oil which is made up of around 50% lauric acid. 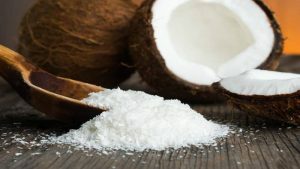 It is worth noting that lauric acid has many health benefits and with it missing in fractionated coconut oil, you may be missing out on some health benefits that you would gain from normal coconut oil. Fractionated coconut oil has the same benefits of mct oil. Below we take a look at ​those benefits to help you understand why its so popular. A diet high in MCTs, which is the main component of fractionated coconut oil, can help you lose weight. There are many studies showing that if you replace other fats in your diet with MCTs, then you will significantly more weight. They suppress hunger and give feelings of fullness, which helps you eat less (​3). Of course don't expect to lose lots of weight by using it. It will help with a modest amount of weight loss which is more likely a better and healthier way to shed the pounds anyway. One review of 13 trials found that compared to LCTs, MCTs significantly reduced body weight, waist circumference, hip circumference and total body fat. The authors, however, also noted that more independent studies needed to be done, as half of the studies were funded by MCT oil suppliers which triggers a high risk of bias. MCTs have been shown to improve exercise performance by giving the body a quick instant source of energy (and less reliance on carbs) and by preventing lactate acid build up (4). MCTs can help improve brain function and are particularly helpful in the case of patients with Alzheimer's. In one study of 20 people with Alzheimer's, one dose of MCTs improved short term cognition. MCTs have anti fungal and anti bacterial properties that can reduce the growth of candida albicans by up to 25%. Candida albicans is a common yeast know to cause thrush (5). One study found that MCTs may reduce insulin resistance as well as improving other risk factors such as weight in diabetics who were overweight (6). MCTs in fractionated coconut oil have been associated with many more benefits than the ones listed here. 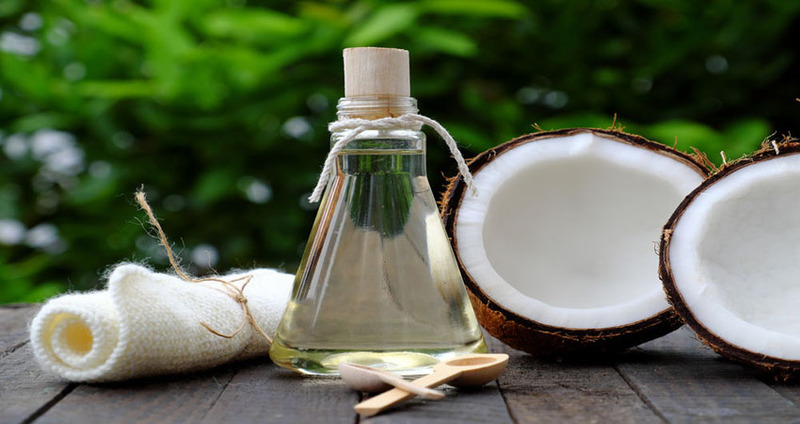 Summary: ​Fractionated coconut oil has many health benefits due to being made up of MCTs. It has menta​l and physical benefits including better brain function, weight loss and ​combating bacterial growth and yeast. One of the benefits to fractionated oil is that it has a longer shelf life. Extra virgin coconut oil tends to have an expiration date of around 18 months, which is quite long. Generally it degrades over this time and contains more AGEs. Unofficially some believe it can stay good for 3 years or so but it is likely to have lost a lot of its beneficial properties the longer it is left. Fractionated on the other hand, appears to have a more indefinite shelf life. This is because most of the unstable compounds in coconut oil have been removed and only the saturated fats are left. These tend to be stabile for a long long time. Most fractionate coconut oil with have 3-5 year use by date, although food grade types such as MCT oil may have the same as standard coconut oil. Of course in all cases, make sure you store your oil properly. Although many people suffer from an allergy to coconuts; most people are less likely to suffer from an allergy to fractionated coconut oil than non-fractionated oil. This because people tend to be allergic to the pollens and proteins in coconut. Fractionated oil is more refined, so these allergens are less likely to be present are the fractionation process. Of course this doesn't mean that you won't have a reaction to fractionated coconut oil, if you have an allergy to coconuts. For the majority of people, fractionate coconut oil consumption seems to be relatively safe and with no side effects. However, some people report digestive problems when consuming fractionated coconut oil. Some people can experience diarrhea, stomach cramps and even vomiting. Thes symptoms can be particularly prominent among children on an MCT rich ketogenic diet. If you experience stomach cramps it may be worth taking a much smaller dose and building up. Summary: For most people, there will be no side effects to taking fractinated coconut oil. Some people may experience digestive issues which could be potentially resolved by building up tolerance with a much small dose to begin with. Fractionated coconut oil is made from the process of fractionation which separates the fats in regular coconut oil. It is generally the lauric acid which is removed, lraving an oil rich in capric acid and caprylic acid. Fractionated coconut oil can have some benefits to mind and body including body fat reduction, better exercise performance and better brain function to name a few. Despite this, fractionated coconut oil has very little or no lauric acid, which in itself is a beneficial fat not to be overlooked or shunned. 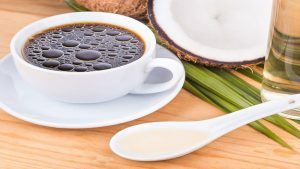 Fractionated coconut oil is great if you want to get the benefits of consuming some healthy MCTs but do not like the taste of traditional coconut oil. If you're tempted to try, you may like our ​mct oil reviews of the best products on the market.